ww2dbaseGeneral George Churchill Kenney was born in Yarmouth, Nova Scotia, Canada, in 1889 while his family was on vacation there. He grew up in Brookline, Massachusetts, United States. He attended Massachusetts Institute of Technology from 1907 to 1911, but never completed his degree, choosing a career with a railroad company as an engineer instead. He enlisted in the United States Army Signal Corps in 1917 as a flying cadet, and was commissioned as a first lieutenant in 1917 after earning reputation as the first man who installed machines guns on the wings of an aircraft. He was assigned to the 91st Aero Squadron in Feb 1918 and flew 75 combat missions during WW1. He was credited with two kills during the war, and was shot down once himself; by the end of WW1 he earned a Distinguished Service Cross and a Silver Star. As the commander of the 91st Aero Squadron at the rank of captain, he remained in Germany as part of the occupation forces until June 1919.
ww2dbaseDuring the interwar years, Kenney was an instructor at the Tactical School at Langley Field (during which time he developed the parachute fragmentation bomb), was sent to Puerto Rico and Virgin Islands to scout possible locations for airdromes, and then attended the Army War College in Washington DC (graduated 1933). In Mar 1935, he was promoted to the rank of lieutenant colonel, in Mar 1940 he reached the rank of colonel. ww2dbaseImmediately following his promotion to the rank of colonel, he was sent to France as assistant attaché, sharing his experience with the French military as well as gathering intelligence on the German Luftwaffe. He sent Washington alarming reports that German aviation technology was far ahead of that of the Americans. He returned to the United States and was assigned command the 4th Air Force with his new rank of major general. In Jul 1942 he was assigned under General Douglas MacArthur as his air commander. ww2dbase"It may truthfully be said that no air commander ever did so much with so little", said General Henry "Hap" Arnold when he was asked to comment on Kenney near the end of the war. However, Arnold did not at first believe Kenney would be able to do the job when he originally assigned him to MacArthur at Brigadier General Laurence Kuter's recommendation. Arnold knew Kenney was the engineer that would always come up with clever solutions to make things work, but Kenney's outspoken personality was perceived as something that might clash with MacArthur's ego. As events turned out, however, it was that very bravado shown by Kenney that MacArthur understood, and thus earning the general's complete trust. In fact, MacArthur trusted his air chief so much that he at least once joked with the press that he had no idea, and did not need to know, what Kenney was doing -- when the press asked MacArthur "do you mean to say you don't know where the bombs are falling? ", MacArthur responded "of course I know where they are falling. They are falling in the right place. Go ask General Kenney where it is." Yes, trucks, too. We can cut the chassis frames in half with acetylene torches, stuff the halves in C-47s, and weld the frames together when we get them up there.... Give me five days and I'll ship the whole damned US Army to New Guinea by air. ww2dbaseAfter the preparations, the first of such airlifts was conducted on 15 Sep 1942, and a month later he was promoted to the rank of lieutenant general. Beyond his capable leadership, he earned MacArthur's utmost respect with his can-do attitude, always finding new methods to achieve the impossible. "George, you were born three hundred years too late", said MacArthur to Kenney, "[y]ou're just a natural-born pirate." Hence, Kenney earned the nickname "Buccaneer" from his commander-in-chief. Later, in a more serious manner than the previously quoted incidence, MacArthur said "[o]f all the commanders of our major air forces engaged in World War II, none surpassed General Kenney in those three great essentials of successful combat leadership: aggressive vision, mastery over air tactics and strategy, and the ability to exact the maximum in fighting qualities from both men and equipment." ww2dbaseIn what would lead up to be the Battle of the Bismarck Sea, Kenney's vigilance led him to the discovery of an important Japanese convoy from Rabaul to New Guinea; in the subsequent actions, B-17s and B-24s sank 12 Japanese vessels, suffering only minor losses. The method he used during this attack was skip-bombing, a concept he developed in 1928 while at the tactical school. Almost all of the 2,900 troops being transferred went down with their transports, with a small handful fortunate enough to swim to shore. Since this tactical victory, Japanese reinforcements to New Guinea would be limited to night runs and small submarine deliveries. ww2dbaseDuring the New Guinea campaign, Kenney deployed a bold plan to use paratroopers on the Japanese airfield at Nadzab. On 5 Sep 1943 Kenney, upon receiving the 503rd Parachute Regiment, launched an attack by 1,700 paratroopers preceded by six squadrons of B-25 strafers. Observing from a high-flying B-17, Kenney and MacArthur were jubilant in the success, and Kenney reported that MacArthur jumped up and down like a small child. ww2dbaseAs MacArthur's forces secured New Guinea, Kenney requested Washington to deploy his long-range bombers against Japanese oil refineries at Palembang, Sumatra, and Borneo. He understood well that without oil refining capabilities, the Japanese war machine would not be able to function at its top efficiency. This plan was never employed, however, as his long-range bombers were all committed to the preparation of bombing the Japanese home islands, and Washington did not wish to place additional risk on loosing the valuable aircrafts. 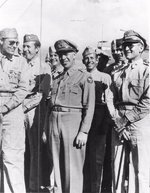 ww2dbaseAfter Manila fell to American control, Kenney's airmen's contribution did not go unnoticed; he was personally informed by President Franklin Roosevelt that he would receive his fourth star and become a full general. He was promoted to that rank on 9 Mar 1945. After which he directed attacks on the Japanese home islands until the end of the war. At the signing of the surrender document, Kenney accompanied his commander-in-chief aboard the USS Missouri. ww2dbasePost-WW2, he was assigned to the Military Staff Committee of the Joint Chiefs of Staff in Dec 1945 and worked with the United Nations. In Apr 1946 he was given command of the Strategic Air Command (SAC) at Andrews Air Force Base in Maryland, United States. As the commander of the SAC, Kenney preached the need for an independent air force. From Oct 1948 until his retirement on 31 Aug 1951, he was the commander of Air University at Maxwell Air Force Base, Alabama, United States. ww2dbaseKenney passed away on 9 Aug 1977.
ww2dbase"Air power is like poker," Kenney was quoted saying. "A second-best hand is like none at all -- it will cost you dough and win you nothing." 6 Aug 1889 George Kenney was born in Yarmouth, Nova Scotia, Canada. 20 Sep 1905 Walter Grabmann was born in Bad Reichenhall, Germany. 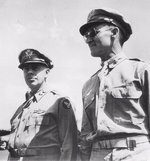 6 Jul 1942 George Marshall asked Douglas MacArthur whether he would like to have George Kenney assigned to him to lead the air forces based in Australia. 28 Jul 1942 George Kenney arrived in Brisbane, Australia and met with Richard Sutherland. 29 Jul 1942 George Kenney met with George Brett (whom Kenney was replacing) and then with Douglas MacArthur in Brisbane, Australia. He spent the latter part of the day inspecting airfields in the region. 30 Jul 1942 George Kenney arrived at Seven Mile airfield near Port Moresby, Australian Papua by a B-17 Flying Fortress bomber at 0700 hours. 31 Jul 1942 George Kenney arrived at Townsville, Australia. 1 Aug 1942 George Kenney inspected Mareeba airfield in Queensland, Australia. 2 Aug 1942 George Kenney arrived at Townsville, Australia and immediately departed for Brisbane by air. 4 Aug 1942 General George C. Kenney assumed command of Southwest Pacific Air Force in Australia. 5 Aug 1942 George Kenney visited Mareeba airfield in Queensland, Australia. 7 Aug 1942 George Kenney requested for the authorization from George Marshall to create an all-American numbered air force in Australia. 9 Aug 1942 George Marshall gave George Kenney his permission to create an all-American numbered air force in Australia. 5 Oct 1942 George Kenney ordered Kenneth Walker to stop personally participating on missions. This order would be disobeyed. 12 Oct 1942 George Kenney met with Kenneth Walker at Brisbane, Australia. 15 Oct 1942 George Kenney and Kenneth Walker awarded US servicemen at Townsville and Mareeba in Australia. After the ceremonies, Kenney ordered Walker to use instantaneous fuses on aerials bombs, not delayed fuses that Walker had preferred. 19 Nov 1942 Kenneth Walker unsuccessfully attempted to convince George Kenney to use delayed fuses for aerial bombs; Kenney preferred instantaneous fuses. 9 Jan 1943 George Kenney arrived at Brisbane, Australia. 9 Feb 1943 George Kenney ordered a series of strong night attacks on Rabaul, New Britain. 26 Feb 1943 George Kenney arrived at Port Moresby, Australian Papua to personally take charge of organizing an attack on Japanese convoy Operation 81; this intelligence was provided by cryptanalysis. 1 Mar 1943 George Kenney and Richard Sutherland met with Chester Nimitz in Honolulu, US Territory of Hawaii. 4 Mar 1943 George Kenney departed Australia for Washington DC, United States. 10 Mar 1943 George Kenney and Richard Sutherland arrived at Washington DC, United States. 14 Mar 1943 George Kenney had lunch with publishers Henry and Clare Boothe Luce in Washington DC, United States. 15 Mar 1943 George Kenney had dinner with Arde Bulova, chairman of the watch making firm bearing his family name, in Washington DC, United States. Kenney convinced Bulova to donate 100 gold watches to award outstanding aircraft crew chiefs, who did not qualify for medals. Bulova would also give Kenney a watch of his own, with inscription "To Buccaneer, as a token of my admiration and respect, Arde Bulova". 17 Mar 1943 George Kenney and Richard Sutherland met with Franklin Roosevelt at the White House in Washington DC, United States. Later on the same day, Roosevelt called in Kenney for a second meeting, during which Kenney successfully lobbied for additional aircraft to be assigned to the USAAF in Australia. 22 Mar 1943 George Kenney was featured on the cover of the Life magazine in the United States. 25 Mar 1943 George Kenney attended the posthumous Medal of Honor award ceremony for Brigadier General Kenneth Walker at the White House in Washington DC, United States. 6 Apr 1943 George Kenney arrived at Brisbane, Australia. 27 Apr 1943 George Kenney departed Port Moresby, Australian Papua for Brisbane, Australia. 1 May 1943 From Brisbane, Australia, George Kenney cabled Henry Arnold, noting that very few aircraft were being sent to the Southwest Pacific. Arnold would promise him enough fighters to form a new fighter group, but he could spare no additional personnel. 12 May 1943 At his headquarters in Brisbane, Australia, George Kenney received a report noting that the morale of US 43rd Bomb Group was sharply declining. 31 May 1943 George Kenney arrived at Port Moresby, Australian Papua to temporarily relieve Ennis Whitehead, who was sent to Australia for treatment for a badly infected toe. 11 Jun 1943 George Kenney returned tactical control of the bombers at Port Moresby, Australian Papua to Ennis Whitehead, who had returned from Australia after receiving medical treatment for a badly infected toe. Kenney departed Port Moresby for Brisbane, Australia later in the day. 9 Aug 1977 George Kenney passed away in Bay Harbor Islands, Florida, United States.